The Boss DS-1X and OD-1X pedals were presented at NAMM last January and they have created quite a buzz since then. Thanks to Roland Australia, I have been able to test them and, well, the buzz is justified! Based on Boss’s MDP technology (for Multi-Dimensional Processing), they are modern digital re-creations of the über classic DS-1 distortion and OD-1 overdrive pedals, the very first of their kind in the Boss line, both released in the late 70s. The DNA of those seminal stompboxes can be heard in those ‘X’ versions, but they go much further in terms of gain and EQ capabilities, these are 2014 pedals, not some sort of vintage simulations (and this is a good thing). – At full blast, they offer more gain that most Distortion or Overdrive pedals while retaining an excellent articulation. My Stratocaster has Kinman noiseless pickups which are not very hot (by design, it’s the blues set) and I often feel the need to use an overdrive to boost my distortion pedals. Not with the DS1-X or even the OD1-X, there is plenty of gain and sustain on tap, even with “vintage output” pickups. – They clean up quite well when rolling off the volume on the guitar, except maybe at the highest gain settings with the DS-1X but that is to be expected. I have tried to demonstrate this in my videos. – They have a very efficient 2 band EQ with a Low and a High knob, a plus compared to a lot of overdrive or distortion stompboxes which only have a tone knob. – There was a time when mentioning “digital” and “distortion” or “overdrive” in the same sentence would make guitarists having instant fits but I suspect we will get none of that with the new Boss offering. As I mentioned earlier, the remarks above apply to both models I think, let me go into what differentiates them. Yellow Boss pedals are usually overdrives, the OD-1X is no exception, with a hint of sparkly finish. It sport four knobs: level for the output volume, low and high for EQ and drive for the amount of overdrive. The drive is quite progressive going from a gritty not-so-clean tone to an all out nearly Van Halen-esque big rock tone. I find that with the gain at 3 o’clock (i.e 75 % or so), there is a sweet spot between clarity and sustain, it’s a very pleasing lead tone. Coupled with the aforementioned efficient 2-band EQ and a good dose of volume boost under tap, the OD-1X is a very versatile overdrive. Tonewise, it is definitely related to the OD-3/SD-1/etc., it’s a Boss overdrive so if you are looking for something totally different, you might be disappointed (although it wouldn’t hurt to try it would it?). Apart from that, it is a top notch overdrive and it is hard to believe it is digital. The sparkly orange DS-1X recalls the DS-1, the first distortion released by Boss and adopted by people like Joe Satriani, Steve Vai, Gary Moore (his early 80s strat Marshall tone was boosted by a DS-1), Kurt Cobain, etc. It has four knobs: level for the output volume, low and high for EQ and dist to change the amount of distortion. And distortion there is, believe me, this would almost qualify as a metal pedal. At low distortion (as shown in videos scattered around this post), it is already quite grittier than the OD-1X. At 3 o’clock, it’s already in the realm of high sustain, searing leads. At full blast, it’s very distorted which makes it a very versatile little beast. The EQ section is very efficient and my little Fender Champ has never been capable of generating so much bass! Despite the amount of distortion on tap, I found that a Strat remained a Strat and a Gibson remained a Gibson. It also cleans up quite well depending on your guitar and pickups, akin to a good amp. The tone is reminiscent of the DS-1 but with more body and a more amp-like quality (rather British if you follow my drift). As such, this is quite a different beast and you might like it a lot better than its venerable ancestor. I was reasonably impressed with the pedals released by Boss in the last few years (especially the BC-2) but not entirely enthralled. Well, they definitely have their mojo back with the DS-1X and the OD-1X, it pains me to have to give them back! Even if the vast majority of boutique stuff is analog nowadays, a few companies have started pushing the digital envelope a bit further recently, and I must say that Boss has just joined them in a spectacular fashion. 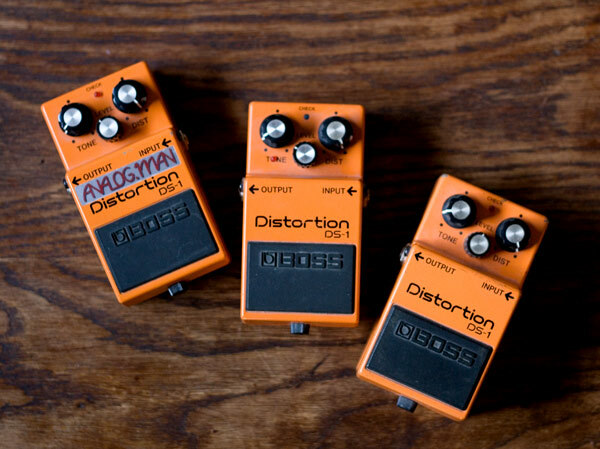 The Boss DS-1 is one of the oldest distortion boxes on the market. Released in 1978, it is revered by some and loathed by others. 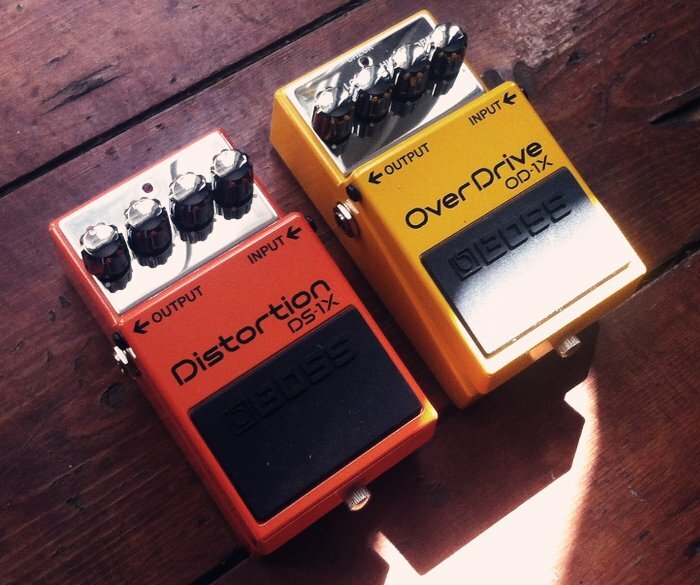 Being a distortion, it offers more gain and more “hair” than a traditional overdrive pedal. Is it often used with a clean amp but it can be used to boost an already overdriven amp. Amongst its supporters, Joe Satriani and Steve Vai are probably the most faithful and the most famous. Although both of them have released signature distortion pedals with manufacturers other than Boss in 2008 (Vai with Ibanez and Satch with Vox), the DS-1 could be heard at their gigs or on countless of their records before that. I see a lot of comments on forums and on Youtube destroying the little orange box, labelling it as “synthetic sounding” or “shrill”. I do not know if it is because of that bad rep but the DS-1 is one of the most modified pedals on the planet. On my quest for tone, I acquired a DS-1 modified by Analog Man and a DS-1 modified by Robert Keeley. I also own a stock DS-1 and before I go into the merits of modified pedals, here is a video I have recorded. It shows the differences in tone between the three pedals. For this video, I have used my Gibson SG 61 Reissue and my Fender Champ amplifier. Delay and Reverb are courtesy of a Boss DD-3 and a Boss RV-3 (See after the video as to why I have used some delay and reverb on the video). First, I owe you an explanation as to why I have used a Boss DD-3 delay and a Boss RV-3 reverb placed after the DS-1(s) while shooting the video. I think a large part of the bad rep of the DS-1 is due to the fact that probably too many people think that getting a DS-1 and using it on a dry amp will get them the tone of Satriani. News flash: it won’t. To me, the DS-1 on full gain combined with Humbuckers is good at a certain type of lead tone but you have to consider the rest of the chain carefully. I think the DS-1 does benefit from some ambiance whether it is delay and/or reverb. Both Satriani and Vai often use some amount of delay in their lead tones. This is where I disagree with a lot of distortion/overdrive pedal demos on youtube where people insist on close miking an amp and use no ambiance at all. It is quite unrealistic as there is 99% chance that on your favorite guitar record, at least some reverb was used to alleviate the super dry tone of a close miked amp. And when you go see a band live, you get the ambiance of the room, even in a small club. Is it worth getting a modded DS-1? Before blowing 150 bucks on a modified pedal, it is quite normal to question the advantages of a modded pedal. From the video above, you will have noticed that the modified pedals retain the essence of the DS-1. It is more about enhancing than radically modifying the tone. I must also say that modded pedals are a bit less noisy than the stock version. But if you really cannot stand the tone of a DS-1, chances are modded versions will not suit you either. As to my opinion, I think the Keeley mod is about getting an edgier, more precise tone while the Analog Man brings the tone closer to a Marshall type amp. I personally prefer the Analog Man for its warmth and it comes close to the Pro Co Rat 2 as my favorite distortion box. But the Keeley might suit you better if you are looking for a more “Vai-esque” DS1 tone. Note that both Keeley and Analog Man have more advanced mods than the ones I am showing in this post. My Keeley version is called SEM (seeing eye mod) and its current version has a toggle switch to go from this mod to another circuit called “Ultra”. The Analog Man DS-1 I show in this post has the Pro Mod which is still available but you can now get a 4th knob to modify the midrange response. Finally, please know that there are other modifications out there like Monte Allums’ which seem pretty popular. I have used the Keeley SEM DS-1 on the lead tone of “The Color Purple” and the Analogman DS-1 Pro on “Electric Rain”. You can find “Fiction”, my first album on cdbaby. On both songs, the pedals were plugged into a Marshall JMP-1 Preamp set clean and an MXR Phase 90 was placed before the distortion. Getting a Marshall type of distortion out of a pedal is a very common desire on the quest for the ultimate tone. Not everybody can afford to lug around a big Marshall stack or you might simply want to have several tonal options within the same rig. Another common complaint about modern Marshall amps is the relatively bland clean tone (although I have recently tried a Vintage Modern model and was quite impressed!). So using one amp such as a Fender or Vox for your clean tone and a Marshall pedal for your overdriven tone can be highly desirable. There are several Marshall eras: the 60s (think early Clapton or Hendrix), the 70s/80s (from AC/DC to Van Halen), the late 80s/90s (higher gain) and the late 90s/naughties with the very successful JCM 2000 range (think modern Jeff Beck)… And the very recent JVM range has apparently gained the favour of Joe Satriani… What has changed through the ages is not so much the basic character of the tone but rather the amount of available gain and various amplifier features (more channels, more eq options, fx loops, etc.). After 5 decades, Marshall still represents THE British rock tone. There are plenty of pedals on the market aimed at emulating the Marshall tone of any era, including a lot of boutique options. Funnily enough, Marshall pedals are rarely taken as examples of “Marshall in a box tone” which I think is quite unfair. They have to be the most underrated pedals on the market. I have presented the discontinued Shredmaster in a previous post and will now present its replacement in the Marshall line: the Jackhammer. 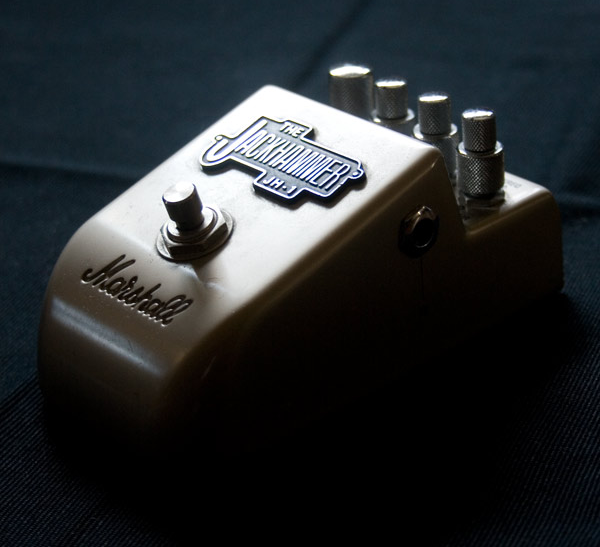 The Jackhammer is part of a trio of overdrive and distortion pedals, alongside the Blues Breaker 2 and the Guv’nor 2. It is the highest gain of the three but is also capable of lower gain tones as you will notice in the demo videos. I think that for the price, the Jackhammer is loaded with features: 2 modes (overdrive and distortion), gain, volume and a sophisticated EQ section with Bass, Treble as well as a mid-range section tweakable with a contour knob and a frequency knob. The Overdrive mode is reminiscent of a quite high gain Marshall amp, think JCM 800/900. The distortion mode aims at creating more modern and gainier tones, kind of a JCM 2000 simulation. The Distortion mode is dark and bassy and also quite noisy which explains why it is getting some bad reviews. Nevertheless, I think it is possible to get some interesting tones out of it. The Overdrive mode really shines and can turn my little Fender amp into a credible Marshall amp. I like the fact that it is silent enough compared to the distortion mode. The amount of gain is not super huge compared to some recent ultra high gain pedals (the Jackhammer was designed in the late 90s) but with high output Humbuckers, you can get some metal out of it! With my Gibson SG, which does not have hight output humbuckers, I can already get some fat sustain out of the Jackhammer. Now this all sounds wonderful but know that one major hassle with the Jackhammer is the Midrange EQ section. It has 2 knobs, one marked contour and one marked freq and it is not exactly intuitive to understand what they do. The Marshall documentation states that these two knobs allow to scoop the mids and choose the frequency to scoop. Getting the settings right is very important as the Jackhammer can sound from wonderful to just ugly just by turning these two knobs a little. You do have to experiment quite a bit as it totally depends on your amp. The EQ section also features a Bass and a Treble knob which are fortunately intuitive and efficient. The Jackhammer can produce plenty of bass so you might want to turn the bass to 9 o’clock for a start. Compared to the now discontinued Shredmaster, the Jackhammer provides more gain and is not as dark which is in my opinion an advantage should you use it with an already dark amp. The Jackhammer settings for this video were: Volume at 10 o’clock, Bass at 9 o’clock, Treble at 9 o’clock for the overdrive mode or 12 o’clock for the Distortion mode, Contour at minimum, Freq at 12 o’clock, various gain settings (see video). The Jackhammer settings for this video were: Volume at 10 o’clock, Bass at 9 o’clock, Treble at 10 o’clock, Overdrive Mode , Contour at 12 o’clock, Freq at max, various gain settings (see video). Marshall Jackhammer Settings: Bass at 9 o’clock, Treble at 10 o’clock, Contour at noon, Freq on Max, Volume at 10 o’clock, Gain on Full. The amp used was a 1974 Fender Champ with Volume around 3, Bass at 10 and Treble at 2.5. It was miked by a RODE NT4 and recorded with a BOSS Micro-BR. A hint of reverb and compression were added in Cubase 5 later on. The pedal settings and guitar used are indicated under each video. I discovered the Soundblox Pro Classic Distortion by Source Audio on I Heart Guitar a few days ago and I loved the concept so much that I thought I should post about it. Source Audio is a little company formed by former Analog Devices VP of of Engineering Jesse Remignanti and Kurzweil Senior Engineer Bob Chidlaw. After spending 5 years scrutinising every distortion pedal on the planet, they have come up with the “Soundblox Pro Classic Distortion” pedal which aims at digitally recreating the tones of well known pedals such as the Electro Harmonix Big Muff, the Fulltone Distortion Pro, the Proco RAT, the Ibanez Tube Screamer, the Fuzz Face, etc. There are 12 models in total. I know what you are thinking: “this has been done before”. 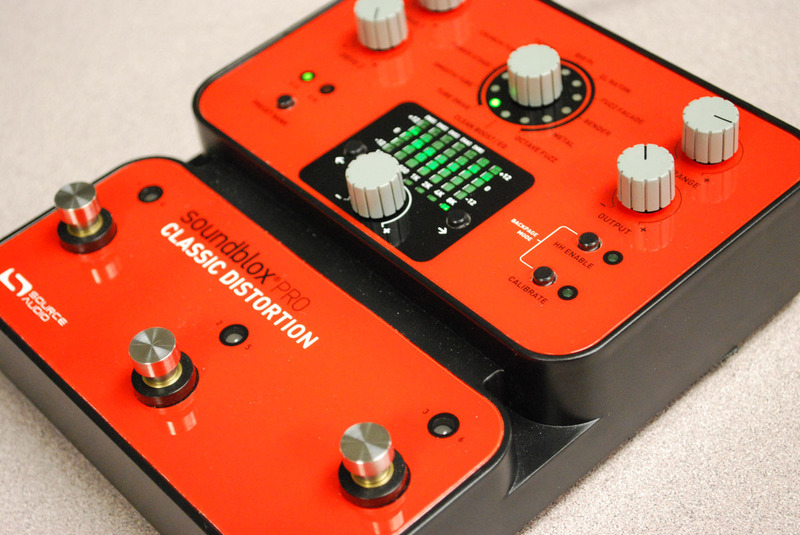 Yes there has been a few attempts but the Soundblox Pro Classic Distortion could very well set a new standard due to its tonal qualities and unique features. First of all, it sports a 7 band equalizer whose settings can be stored with each of your 6 presets. I think this is a pretty neat idea and frankly, I don’t know why most distortion pedals stop at 3 or 4 bands. Secondly, using an external expression pedal, it is possible to morph between 2 distortion models and get a huge number of variations. I am not just talking about mixing the tones of two pedals here, what happens is more a “fusion” in the digital domain between two models, creating entirely new “hybrids”. So what should a RAT morphing into a Big Muff be called? A Big Ruff? Third, the Soundblox Classic Distortion has a MIDI input allowing it to integrate with complex rigs and be remotely controlled. And last but not least, it looks like a hot rodded space ship from outer space which is always a bonus. The Classic Distortion is not the only pedal in the Soundblox Pro range at Source Audio, you will also find another model aimed at creating more “modern” tones called the Soundblox Pro Multiwave Distortion (which also exists for bass). And let’s not forget the “Hot Hand” series of products such as the Phaser/Flanger where you can control the amount of wobbling by shaking your hand (using a special ring, take a look at the video). And the good news is that the hot hand ring can also be used to control the Soundblox Pro Classic Distortion. I think it is pretty cool to see some innovation in modeling !